River Ave. Blues » What are realistic expectations for Greg Bird in 2018? What are realistic expectations for Greg Bird in 2018? As expected, the No. 1 story so far this spring has been Aaron Judge and Giancarlo Stanton. Every single day it’s Judge and Stanton, Stanton and Judge. And that’s understandable. They’re both great and now they’re teammates. When the Yankees have players like that, they’re the center of attention. It’s a good thing for baseball. While Judge and Stanton hog all the headlines, other young Yankees like Gary Sanchez and Gleyber Torres have mostly flown under the radar. Sanchez was hitting missiles in batting practice the other day and the ESPN News broadcast — I still can’t believe they cut in for spring batting practice — didn’t say a word. Torres is in the running for the second base job and hasn’t been talked about much, relatively speaking. Also flying under the radar: Greg Bird, no pun intended. Granted, position players have only been in camp since Sunday, but there’s still been very little chatter about Bird. Last year he was the talk of camp between the return from shoulder surgery and the way he hit in Grapefruit League games. Now he’s coming off a nice postseason run and will again try to stay healthy, yet nothing. Everyone is talking about Judge and Stanton. “I think he’s an impact middle of the order hitter on a championship caliber team. 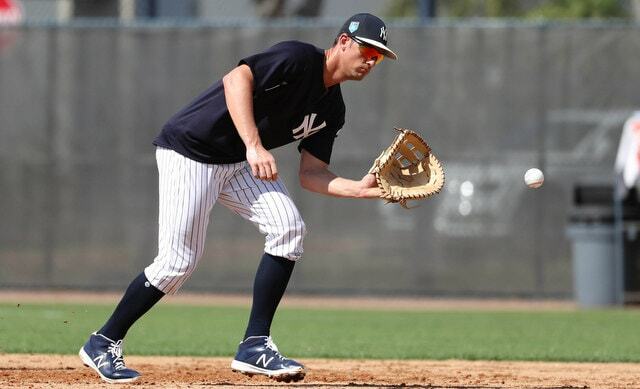 I think when we see him healthy and at his best I think he’s a guy that will be a real option to hit in the middle of our order,” said Aaron Boone to Bryan Hoch yesterday, reminding us that yes, Bird is talented and the Yankees love him. The injuries have been unfortunate. When he’s been healthy though, Bird has produced. When healthy — he played hurt before going on the disabled list last year — Bird has been pretty good, and there’s every reason to believe he will continue to be good as long as he stays on the field. Exactly how good? No one really knows, because even when Bird was healthy, he wasn’t really healthy. He played through the shoulder injury in 2015, and late last year he was coming off that long layoff. 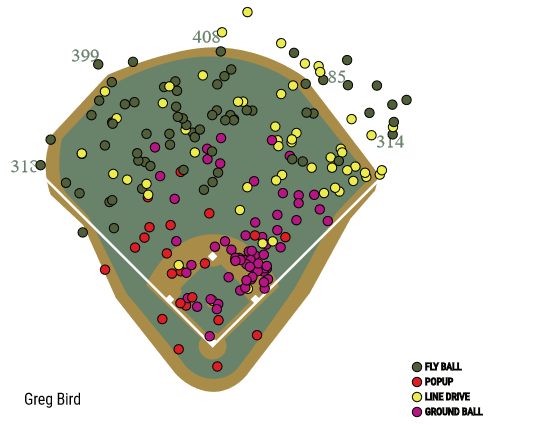 When Bird makes contact, he tends to hit the ball hard, he tends to hit the ball in the air, and he tends to pull it to right field. Two-hundred-and-four left-handed batters have at least 300 plate appearances since Opening Day 2015. Among those 204, Bird has the lowest ground ball rate, the ninth highest hard contact rate, and the 35th highest pull rate. The guy was built for Yankee Stadium and the short porch. The power will be there as long as Bird is healthy. I think the walks will be there too, because his chase rate on pitches out of the zone (25.5%) is well-below the league average (29.9%) and because watching him play, Bird is very patient and calm at the plate. He knows what he’s doing out there. I’m not sure he’ll run a Judge-esque walk rate (18.7%), but something north of 10% seems very doable. So many ground balls to the right side. So, so many. Hey, when you hit the ball hard in the air to the pull field as often as Bird, you’re going to roll over on a few. It happens. Bird has not been an all-fields hitter thus far in his career and that was never the book on him coming up as a prospect. He’ll lose some hits to the shift. He’ll hit a lot of balls over the shift and into the seats, but he’ll also lose some hits to the shift along the way. And you know what? Losing hits to the shift is fine. It’s annoying, believe me I know, but you take the bad with the good. Bird is going to pepper the short porch and work walks. I don’t see him as a .300 hitter or even a .280 hitter, but I do think the various projection systems are low. I think Bird can be a .250/.340/.500 guy this season as long as he stays on the field. There might even be more power in there than that. Now it’s just up to Bird to stay on the field for a full season to show he can do it.